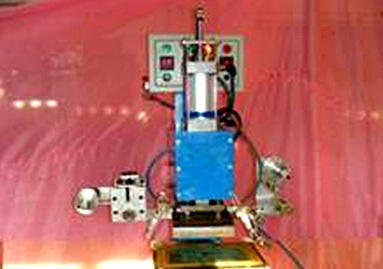 We manufacture a wide range of Semi Automatic Hot Stamping Machine used for flat objects. These machines are widely acknowledged for their high Accuracy and smooth movement. These are ideally used for hot stamping on Plastic Panel, Clock, Paper Box, Garments, Books, Leather Goods, Wood and Paper Products. 7. Weight : 180 KGS. • Operator friendly Machine design. • Die Pressure can be controlled easily. • for foil feed adjustment. • Special design for foil feeder. • Operating temperature can be adjusted from 0 ~ 400°C easily. • Foil feed roll guide. • High efficiency structure of pneumatic system, with easy adjustment and high stability and durability. • The level of heater can be easily adjusted. • Foil feeder with special motor rotates very accurately. • The machine can be easily moved.